Episode Theme: The best way to help a struggling friend is not with our knowledge, but with our compassion. 1. 2 Corinthians 4 says that we can comfort others with the comfort that God gives us. What does this mean? How can you pass God’s comfort to others? 2. Ruth 1:1-17 tells the story of two women. Naomi’s husband and sons died, and she was left poor and alone. She decided to travel back to the place where she was born. One of her daughters-in-law, Ruth (who had been married to one of Naomi’s sons), said she would go with her. Naomi told her not to—there would be nothing there for her and they wouldn’t have any possessions or food. But Ruth insisted. She said she would go wherever Naomi went and share all of Naomi’s troubles. She worshiped God, just as Naomi did, and she said they would take the long trip and deal with their problems together—even if it meant they would die together. Ruth took care of Naomi and comforted her as long as she needed it. As you listen to this episode, think of ways you can show comfort to others. 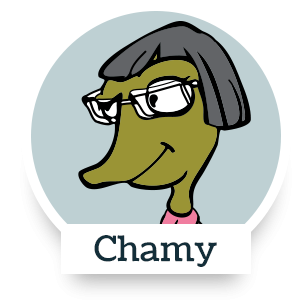 In this episode, Chamy is upset about her parents’ divorce. Her friends try to cheer her up, but the only thing that helps is the one friend who just listens and cares. Do you have friends with serious problems? Maybe they’re sad because someone has died; or maybe, like Chamy, their parents are getting divorced. Problems like these are too big for you to fix. It won’t help to tell them “everything will be OK” or “just relax.” In fact, there’s probably nothing you can say that will help much. But there’s something you can do. It won’t solve the problem, but it will make them feel better. You can care. Just listen if they want to talk, or sit with them silently if they don’t. The Bible puts it this way: When others are happy, be happy with them, and when they are sad, be sad (Romans 12:15). Want to dig deeper and learn more about how you can be a comfort to others? Read Ephesians 4:2, Philippians 2:1-2, and Colossians 3:12. What Bible verse did Spike tell Chamy? What did Spike name his plan to help Chamy? How did Kayla try to cheer up Chamy? 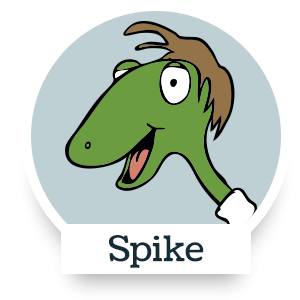 What did Spike get from Mr. MacKomodo? The key to the elevator. What helped cheer Chamy up? How good are you at listening? For the next week, practice listening to your friends and family members instead of doing a lot of the talking. Ask them how they’re doing, and then just listen. Don’t think about what you’re going to say next. If they tell you about their problems, don’t try to fix them. Just be there with them and listen. At the end of the week, think back. How did it go? Do you think you encouraged or comforted any of them? Remember, God is always willing to listen to you, too. Create your own “Promise Coupons” and give the gift of service this Christmas season. Here's a great Christmas song to share! It's a dirty job, but some lizard's got to do it. A song from Kids Corner. Here's a song about learning to serve others. Download it for free. Have you ever met anyone that reminded you of Jesus? Come meet Dorcas. Has the message of God's love ever amazed you so much that you could feel your heart changing within you? 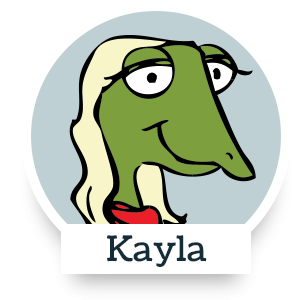 Then you should meet Lydia. Grandpa and Liz are on a treasure hunt! They’re following clues left behind by Grandpa’s childhood friend. What’s the next clue—and what treasure is hidden somewhere in Terrene? Clubhouse Theater presents the story of Esther. Who is she in the Bible and why is she so important? Clubhouse Theater presents the story of Esther. How can she save God's people? Will she give the ultimate sacrifice? Chance Calhoun and the Rodeo are in town! Liz wonders what it takes to be a true cowboy. Is it all glory or might he have to get a little dirty? Liz and Lucille are drawn into a super adventure story with two caped crime fighters. Giant challenges abound as Liz and Lucille work to accomplish their own humongous mission. Can the story of a little boy and five stones help everyone to get the job done? It's a hero's homecoming! Liz returns from his adventure. Will anybody notice? Liz finally makes the football team, but that just the start of his problems. Will he be able to stick with it or he going to have to quit the team? The greatest movie ever made! That’s Liz’s goal. Looks like it will be another disaster unless Lucille comes to the rescue. Check out this episode for the best action-adventure-romance-sci-fi-western ever made! The birth of Jesus as seen through the eyes of Mary. What is perseverance and how does it fit in a christian's life? It's story time in Terrene as Grandpa tells tales about the importance of determination. Spike and Cole's pizza business is booming, and Chef Boy R Liz wants to join the team! 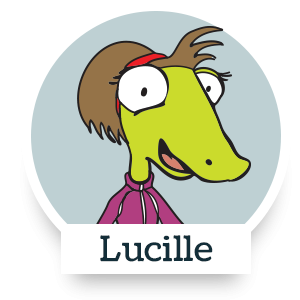 Meanwhile Lucille tries to teach the gang what it means to blessed and how to be a blessing. Look out! A racing team has invited Liz to join them. 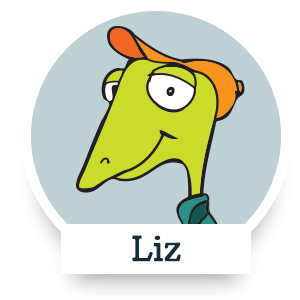 But when Liz is assigned to clean up the garage and arrange the tools, he’s disappointed that he's not an important part of the team! During Christmas, Liz and Lucille try to help the Knight family. But what secret are the Knights not telling them?